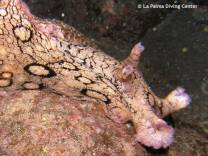 Los Cancajos is one of the best diving related areas in La Palma to make a few dives. There are many beautiful dive sites around the island, but the decision for Los Cancajos, in the east of the island, as a starting point is very easy. Here you may find the most diverse diving areas, which can be reached easily without problems by everybody. At a short distance from the shore one is rewarded with a fascinating underwater landscape in the clear blue waters of the Atlantic. Vertical walls and steep slopes are stretching into depth beyond sports diving. There are woods of black corals already at a diving depth of 30 meters. Underwater meadows consisting of bright yellow tube sponges can be seen at a depth of 20 m. In the shallow water area, green and brown alga, sway to the rhythm of the waves. In the areas of black lava sand one finds plaice, diamond lizardfish and brown garden eel. Should other diving places offer better diving conditions or if you wish to also get to know the west or the south of the island, we organize frequent tours to show you the Isla Bonita from its most beautiful side, over as well as under water. It doesn't matter whether you are just beginning to discover the world under water, are re-entering into diving or are already an experienced diver, our nearby reef situated directly behind the breakwaters, enables diving of all degrees of difficulty. The reef of Cancajos is reached through a comfortable entry from sandy beach. In this spot, situated within a lagoon, it is possible to dive the whole year round, it is protected by a breakwater and offers the perfect basis for instruction courses and night diving. Outside the bay the diving area stretches down to a depth of 30 m. There a lava headland breaks the sand area. In the northern part are lie the remains of a plane wreckage. Scarlet sea fan has settled on the sand, planehead filefishes are swim there.